Online gambling is nothing new for the state of Delaware. They were the first state to fully legalize state licensed online gambling. After the 2011 DOJ Formal Opinion on the Federal Wire Act the wheels started turning for online casino and poker games to be offered in states that were ready to fully legalize, giving birth to Delaware online gambling entertainment. Delaware was the trailblazer in the online gambling industry and was soon followed by New Jersey and Nevada. Delaware has since entered into the industry’s first interstate online gambling pact with Nevada. Though Delaware was the first state to legalize, they were not the first region to launch a state sanctioned online gambling initiative. Nevada was the first state to launch state licensed online gambling with their online poker platform, with New Jersey and Delaware launching a few months later with both online casino and poker gambling options. Delaware will go down in history as one of the pioneers of the US based online gambling revolution. This section of our guide is dedicated to taking a look at the many facets of Delaware online gambling, what it has to offer, what gambling laws affect it, and how resident of DE can legally participate in licensed and regulated online gambling entertainment. We also discuss how legal offshore United States online gambling intersects with the state based gambling market. Yes, it is. According to Delaware gambling laws, the state based options are only available from the already established brick-and-mortar casinos. The state regulated online gambling initiative has been a hit in the tax revenues since 2012. What is a little less known fact about US federal gambling laws is that they have never criminalized anyone for placing bets online anyway. Offshore online gambling all over the US (except Washington, who has specifically criminalized it) has always has been legal, even before it was specifically legalized on a state level in regions like Delaware and New Jersey. Residents from Delaware have always been able and are still able to use all of the legally regulated and licensed offshore gambling websites that have been functioning in the international world for decades. Until the state passed legislation legalizing the state regulation of online casino and poker gambling within state lines, it was illegal to own or operate an online gambling site in DE. Now, businesses that meet the criteria can obtain legal licensing to operate online casinos and poker sites for resident of the Diamond State. 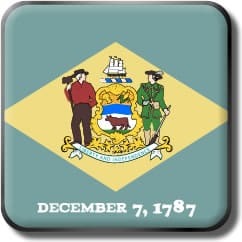 It is legal for residents of Delaware to enjoy online casino and poker gambling at any of the state licensed gambling sites and at legitimately sanctioned offshore gambling sites operating legally within the industry. Legal Delaware Online Gambling Sites. These are the offshore sites that we have been talking about. They have had the pleasure of existing with large customer bases outside of the United States for a number of years and have flourished in the face of international competition in the online gambling industry. We have been involved in the industry every step of the way for the last 20 years, researching, vetting, and questioning every step. Our team of specialists take every precaution in researching these websites that we recommend, providing for you the best example that we can find of what you should expect from your online gambling provider. They are all legally licensed and regulated, and offer a safe, high quality gambling experience. Can I Play Real Money Casino Games Online In Delaware? You have your choice of state-regulated online casinos from either Delaware or Nevada because of an interstate gambling pact that is in place. You can also choose from any of the international providers that offer real-money online casino games that operate in legal jurisdictions outside of the United States. Games like Roulette, Baccarat, and all the variations of Blackjack along with slots, video poker and other specialty games are available to you through both domestic and offshore gambling sites. Get more information from our guide to understanding Delaware online casinos. Can I Play Poker Online In Delaware? Online poker rooms were also excluded from the 1961 Federal Wire Act when the DOJ issued their formal opinion in 2011 and therefore opened up for the states to legalize at will. Delaware promptly legalized and allows its residents to play online poker at state regulated online poker rooms. These, on top of the offshore poker websites, are completely legal to use for residents of Delaware. The poker sites recommended in this guide all provide a legally sanctioned environment to play poker online. You can learn more on our page dedicated to covering Delaware online poker. Can I Bet On Sports Online In Delaware? With online sports betting, your options are limited to those that exist outside of the US federal jurisdiction. The Wire Act that was reclarified in 2011 to pertain specifically to sports betting and no other forms of online gambling, which means it has not been legalized by even the most liberal states like Delaware. Nevertheless, there are no federal laws in the United States that would stand to give you any trouble at all by placing your sports bets with online providers granted that they have the proper regulation and are under the appropriate sanctioning bodies outside of the United States. Find out how to legally bet on sports at Delaware online sportsbooks. Can I Play Bingo Online In Delaware? Bingo is one of the sub genres of online gambling that has benefitted most from the modality of the internet. It is completely safe for residents of Delaware to seek out and find those appropriately regulated and licensed online Bingo websites that play with real-money on the line. You will be able to access games with 30, 75, 80, and even 90 balls that play with all of the different types of win patterns from coverall to the fixed static patterns you’re probably used to at your local bingo hall. All of these are completely legal for the residents of Delaware from either the state-regulated sites or the internationally regulated sites. Gain insight into Delaware online bingo sites and how to legally play bingo for real money at these licensed destinations.